The 2018 NBA All-Star Weekend hits Los Angeles, CA starting Friday, February 16, 2018. 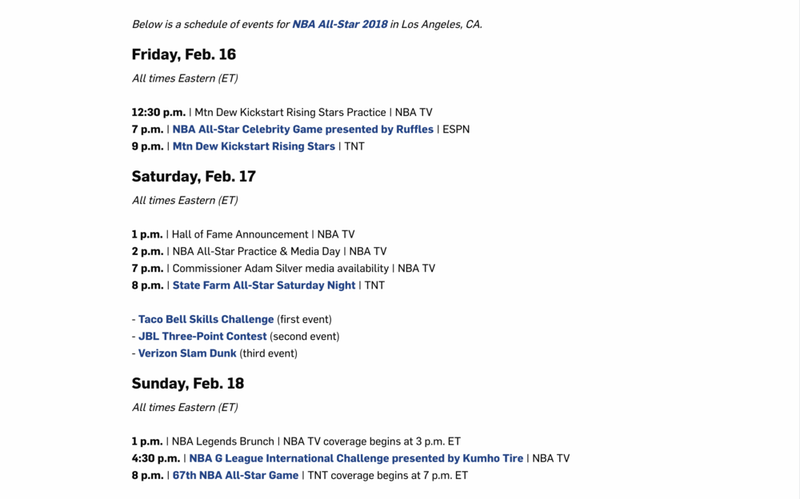 Below we have provided a few guides of where all the events will be, starting with the NBA and their schedule CLICK HERE! Adidas will also be hosting an event which is totally by invite only and super exclusive with celebrity and athlete appearances that will be held at 747 Warehouse St, Los Angeles, CA 90021 on Friday & Saturday February 16-17th (CLICK HERE). The warehouse is an immersive tour that will be housing three distinct experiences. 1. Evaluation of performance in the test center 2. Building the future of footwear on the production line 3. Driving culture and creation in the engine room. There will also be a celebrity game between Team Snoop Dogg and Team 2 Chainz that should be nothing but pure entertainment! Again, this event is invite only but if you can find away to make inside it will be worth your time! Big Baller Brand will be having a Pop up shop at Cool Kicks which is located on 7565 Melrose Ave Los Angeles, CA 90046 Lavar Ball and Lonzo Ball will be there and you could win a free pair of ZO2's Lonzo Ball's signature shoe! Newer PostDay 1 of NBA All-Star Weekend! Older PostBlazers beat Warriors in Thrilling Win!